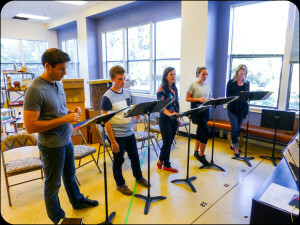 Snapshots is deep in rehearsal at The Village Theatre in Issaquah, WA, preparing for Opening Night! The show is sure to be wonderful with the amazing vocal talents of the cast being musically directed by the great RJ Trancioco. Danny Goldstein brings his remarkable direction to this production, and David Farley has designed a fantastic set. All told, this will be the ultimate production of the show. Don’t miss it!